I’ve been reading some great books lately. I found a series, thanks to the Amazon Kindle Lending Library, by Ann Charles, that I’ve been reading like triple chocolate cupcakes. 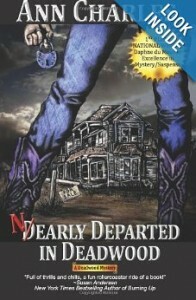 It’s her Deadwood Mystery Series. I’d probably have thought nothing of it save we spent an afternoon in Deadwood, SD last summer on our Great Roadtrip with our goddaughters. We had a blast there right before the South Dakota rains washed out the camping options and we had to spend a night sleeping in our car… all four of us. While that was a less than stellar experience, I have such fond memories of South Dakota that I clicked on the first book in the series and fell in love. The main character is Violet Parker. She’s a thirty-something single mom of ten-year old twins. She’s had a rough time of it financially and she’s moved to Deadwood to live with her aunt while she gives being a real estate agent a go. Through her job, she meets a merry band of characters that become a part of her life in fun, interesting, and, occasionally, tragic ways. Each book picks up where the last left off, so there is continuity and you will want to read them in order. The books are comedic mysteries with some thriller action tossed with a light vinaigrette of romance. There are four books in the series plus some short stories. I’ve not read the short stories, though I’ve consumed the books with gusto. They are a quick, easy read. There is no vocabulary to question, no great moral issues to ponder. They are simple fun, fast-paced, and absolutely addictive. I love mysteries and, while I had my suspicions about some parts of the equation, there were some twists that were a complete surprise to me. I love that in a mystery. Now that I’ve finished the fourth book, I find myself missing Violet’s world and her adventures. I’m really looking forward to the next in the series.